Indian Beauty Blog | Fashion | Lifestyle | Makeup | SparkleWithSurabhi : 7 Dangerous Acts After A Meal!! 7 Dangerous Acts After A Meal!! 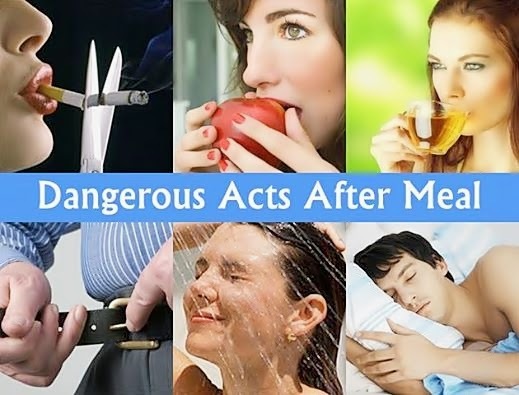 The 7 Dangerous Acts after meal!!! * Don't smoke- Experiment from experts proves that smoking a cigarette after meal is comparable to smoking 10 cigarettes (chances of cancer is higher). * Don't eat fruits immediately -When you eat your fruits with meals, the fruit is stuck in the stomach along with the contents of the meals and cannot reach the intestines in time. Lying there they get spoilt and spoil the remaining food in the stomach too. Thus it is recommended that you eat a fruit at least one hour after eating a meal or before your meal and preferably in the morning with empty stomach. It is in the morning that the body can best use the nutrients in the fruit and get enough energy to start the day. * Don't drink tea - Because tea leaves contain a high content of acid. This substance will cause the Protein content in the food we consume to be hardened thus difficult to digest.It is preferable to drink tea an hour after meals. * Don't loosen your belt -Fiction, not particularly bad for you! We generally have an attitude that a good meal is that which forces us to loosen our belts. However, loosening the belt is bad, not because it causes the intestines to twist or block but because it means that you have over eaten to a level that you are uncomfortable. Loosening of the belt may also cause you to feel comfortable once again which means you may continue overeating. So eat only to the extent that you can be comfortable without loosening your belt! * Don't bathe - Bathing after meal will cause the increase of blood flow to the hands, legs & body thus the amount of blood around the stomach will therefore decrease. This will weaken the digestive system in our stomach. * Don't walk about -Fact, it is bad for you! Walking directly after meals is a bad idea, it can result to acid reflux and indigestion. However, walking about half an hour after meals is known to be good for you. Researchers in the Department of Exercise Science at the University of South Carolina, have found that walking after exercise is a good way to burn energy. The point to note is when to walk, you should ideally walk for about 10 minutes and only 20-30 minutes after meal to prevent acid reflux and stomach upsets. * Don't sleep immediately - The food we intake will not be able to digest properly. Thus will lead to gastric & infection in our intestine.